Ethiopia Reads News: Ethiopia Reads featured in GOOD HOUSEKEEPING Magazine! Ethiopia Reads featured in GOOD HOUSEKEEPING Magazine! Ethiopia Reads is thrilled to be featured in the October issue of Good Housekeeping! The eight-page feature story, "Hope Volume I," was written by the wonderful Melissa Fay Greene,w ith photos by J Carrier. Look for your copy on newsstands now. This spring, Melissa spent a few weeks in Addis Ababa and Awassa, getting to know Yohannes Gebregeorgis, Ethiopia Reads' co-founder and Executive Director. Melissa also spent lots of time with children at Shola Children's Library and the Awassa Reading Center, and saw first-hand the power of books in the lives of children. As Melissa reports, books for children are a rarity in Ethiopia, as are so many educational resources and opportunities that Americans take for granted. Yet Ethiopian children -- like children everywhere -- love books and stories, as well as the sanctuary of a library. Literacy is the tool that will improve their lives and the lives of future generations of Ethiopians. "Literacy is now understood to be a threshold to greater productivity, better health, longer life and decreased maternal and neo-natal death rates....Children exposed to books will look beyond a lack of material goods to a world of possibilities." "Books saved my life," Yohannes says, after sharing his story about how exposure to books as a teenager opened his mind to a reality he had not previously known. Freelance photographer J Carrier visited Awassa and Addis Ababa in July, and his beautiful photographs are a stunning compliment to Melissa's story. 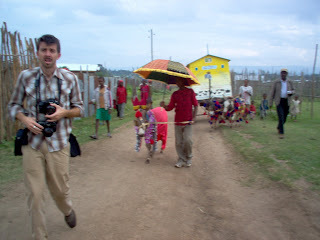 The above photo shows what went on behind the scenes as he captured the procession of Queen Helina and the Donkey Mobile Library through a rural enclave on the outskirts of Awassa. Children came running from every direction, as did curious adults -- even goats, dogs and chickens! Thanks to GOOD HOUSEKEEPING Magazine for publishing this article, and thanks to our friend Melissa Fay Greene for letting the world know about individuals and organizations working on behalf of children everywhere. Melissa is the author of the groundbreaking book There is No Me Without You, which introduced millions of readers to the plight of Ethiopian children orphaned by and living with HIV/AIDS. Ethiopia Reads' mission is to create a reading culture in Ethiopia by connecting children with books. Our supporters include readers, writers, educators, librarians, children, grandparents -- anyone who shares our belief that books do make a difference in the lives of children. We're delighted that you found us! We were at the Shola Children's Library in Addis Ababa in 2005 and found it a remarkable place. On a Saturday afternoon every one of the 126 seats were filled with children reading and doing homework. We were fortunate to have the opportunity to read to them in groups, and the children were very attentive. Yohannes is doing a wonderful work in this very poor country. My only regret during our visit was that we arrived there before the launching of the donkey mobile libraries. I would have loved to have been there for that! By the way, if you're looking for a truly special holiday gift for your loved ones this year, consider the alternative gift of a library for one of the Ethiopian schools that Yohannes is working with. Think about it - tables, chairs, shelves, storage, all the library paraphrenalia needed to set up a system, cataloging materials, a desk, checkout area, training for the teacher-librarian, plus 2,000 books to get them started - not a bad deal at all! We're getting one to honor our parents this year. This is truly an amazing organization. I'm inspired to do what I can to contribute books/money/local support (from US local libraries). On the website there is a list of donations one can make...everything from a dollar on up. Just one dollar funds the publication of one book. What a wonderful idea. Kids can join in this giving process. And what fun to read about the "Queen Donkey" that leads the mobile library processions. Thank you for your great vision and success. Your success should continue and we would like to ask few questions. 1) Ethiopia reads is in Ethiopia and for Ethiopians. Is it possible if the website includes something in our own language? We want to see more books in our language and this will encourage some writers. 2) Why Ethiopia reads board members are exclusively non-Ethiopians, except Ato Yohannes? Isn't it in Ethiopia? Please consider it.